reader subscriptions. Entire contents copyright 1991 ACRAG. subscription to: ACRA Group, P.O. Box 700664, San Jose, CA 95170.
are registered trademarks of Apple Computer. York from July 17-21, 1991.
credibility of the Armenian Church is at stake. and resources together, as it did at the Conference. is not a single priest to tend to the needs of the community. not–we all know that glasnost without perestroika is not enough. Fr. Vazken Movsesian provides an inside view of the Conference. Director of CPF and Bp. Hovnan Derderian, Primate of Canada. Church’s mission in the Diaspora. Church, especially at this crucial historical juncture. participation at the conference, he knew, was purely symbolic. about the most vital issues of the Church they served. meeting room was the extent of any artificial means of movement. June 17 – 21, 1991. This was the first international conference of Armenian clergy. of brotherly respect and fellowship. Hovsepian was elected president of the assembly, along with Abp. Zaven Chinchinian of Egypt, Bp. Mesrob Krikorian of Vienna and Bp. comments addressed various issues that are pressing for answers. repressing their progress. Yet, the worker in the field, Fr. of Armenian-American men have been moved to enter the priesthood. one Armenian in Europe accepting the call. president, to explore issues in the Church. major achievement and certainly the first step toward recovery. Bp. Barkev has successfully undertaken. understanding of religion and the function of the Church. pray. They demanded to be taught as well! Apart from this, he has overseen the renovation of churches. harmony. They have purchased cars and buses for transportation. faithful singing the Divine Liturgy and other services. architectural and dogmatic facets of the Church. God. He asks for only one thing for Kharabagh: our prayers. with our people and is working in Artzakh. in faith; COMMUNE: to receive and be united with Christ Jesus. region and there is an unquestionable faith in the power of God. REPENT, BE BAPTIZED AND COMMUNE. and appeals to our people. spiritual, educational and national nourishment to the survivors. began pastoral service to fill the needs [of the Church]. In the Mother land, the situation is completely different. of clergy to instruct our people. people. Our life is a perpetual struggle. this world, we must struggle to keep our faith and nationality. Armenian– to keep his ties with the Armenian Church people? difficult in these new communities. b. Election of a locum tenens of the Catholicos of All Armenians. make decisions for the benefit of the Armenian Church and people. of operating in light of the present reality. monasteries and churches, but we are allowed to build new ones. conscience in which the Church has played an important role. clergy in Armenia see themselves as ritual performers. Center is headed by Fr. Abel Oghloukian. Fr. Shnork, Fr. Center also paid special attention to the media and publications. published in various newspapers of the country. we are consoled by the results of our activities and work. systems and resources, such as literature in massive numbers. Eastern Diocese were sent to the Holy See to assess the situation. awakening in Armenia–in a true Christian and national sense. that was developed in monasteries and religious institutions. dedicated clergy teach at the Seminary [of Holy Etchmiadzin]. foreign beliefs would not find a place among our people. absolutely necessary that we combine our efforts and resources. undying legacy–to lead the people entrusted to us. Armenia. Its fundamental purpose is to evangelize. to prepare this many teachers. for the invention of the Armenian alphabet only. doing this as a stop gap measure. with the national awakening, the national renaissance. self-consciousness has been kneaded by the light of Christianity. Therefore, it is not possible to separate one from the other. psychological complexities and neurosis among the youth. WINDOW: What is the current status of the CPF? is disbanded, then the department will be weakened. and building of our Church and our people on a large scale. program, and plan a working process. meetings. This should distress us seriously. have expertise in this regard. This should be their sole concern. view of the Armenian Church. We call it “Loosamoud” in Armenia. dealt with the Cults in Armenia [vol. II No. 1] is very important. should be published under your guidance, direction and editorship. and professionalism of Window. Especially, the presentation of Fr. it and do the final editorial work very shortly. is that the organizers are others, not the Church. they established ties. This is how they gain converts. were or were you incognito? of the Armenian culture or national aspirations. myself felt a wave of uneasiness. the message, what is the substance of preaching? general public can hear and be informed. Dioceses in Armenia avail themselves to your expertise? WINDOW: Could you tell us about the movement in Khor Virab? effort in every way, so that they could stand on their own feet. in the traditional and beautiful nest of our people. for the Church come from? Armenian Church which has no ties to the Mother Church. Azerbaijan and to some degree Georgia. continue its peaceful and safe existence. the propagation of the Gospel. Yerevan, but even more, in the outlying large and small villages. concentrate on preaching the Gospel. the children of our Church. and the Church must fulfill its purpose through evangelization. throughout the country are not established in an organized manner. live outside the boundaries of their own parishes. be the concerns of all clergy. not to express ourselves on these wrongs. necessary encouragement from certain diocesan bishops in Armenia. hurts the entire mission of the Armenian Church. WINDOW: Is this a problem of administration? or all other programs within the Armenian Church will fail. vijag] exists in Armenia. I have been an eyewitness to this. indifference on the part of the clergy. inhospitable, but that is not a reason to refuse such a procedure. Ankara, the seat of the Turkish government. to knock down the roofed structure. municipality and the central government. Protest is a sign of the weak. then write letters of protest. I do not serve the Armenian Church or the Armenian People. friends of our Lord were Lazarus and his sisters Martha and Mary. from Jericho to Jerusalem. We have mention of this family in St.
triumphal entrance into Jerusalem on Palm Sunday. speculation in Christian theology and spiritual reflection. that my sister has left me to get on with the work by myself? her sister Mary who she thinks is avoiding her responsibilities. refuses to reprimand Mary. He will not command her to help Martha. value physical and political survival so highly. and genocide of 1915 to think in obsessively survivalistic terms. is a play on words which instructs and does not merely entertain. food salvation is not possible. the heavenly breadPMary’s good portion. critical and dangerous moment for the Armenian Church in America. she could call friend as well as Lord. Bethany, where Lazarus lived whom he had raised from the dead. witness to the truth which gives us life and sets us free. nation and all who would accept the word of God into their hearts. have failed. The Lord will hold all of us accountable for this. uniqueness into an idiom suited to future generations. Church’s long isolation from the other Christian churches is over. for the”gospel” of Jesus Christ. Christian life as discipleship, witness, and service is required. in Christ called to be the salt of the earth. Christian instruction which I just described. and study of scripture and pursue together projects of service. The Armenian Church is afflicted by the latter. include our mothers, sisters, wives and daughters. and mothers did, the appellation apostolic. for the Propagation of Faith, 1990, 105 pp., + appendix. record business as the line outside for baptisms grows to forty. revival of Christianity in Armenia. “these little ones” which our Lord so admired (Mt. simple answers to simple questions about the Christian faith. and a glossary of names from the New Testament. crossing oneself, bowing, raising the hands, etc.). up, close the book and go to sleep. at the height of Catholic scholasticism. are regularly exposed to the Church. Yet Fr. our people’s faith in Armenia. than usual and they have been quite interested. these vulnerable moments as well as those moments of strength. experiencing Christian and spiritual support and fellowship. family reads from cover to cover. My thanks to Fr. Vazken, Dn. Hratch and staff for a job well done. on certain segments of a newly democratized Armenian society. religious education of the youth. big void! Keep up the good work! Armenian Church strengthened by your efforts. Vol. I, No. 4, Is the Collar Choking the Clergy? 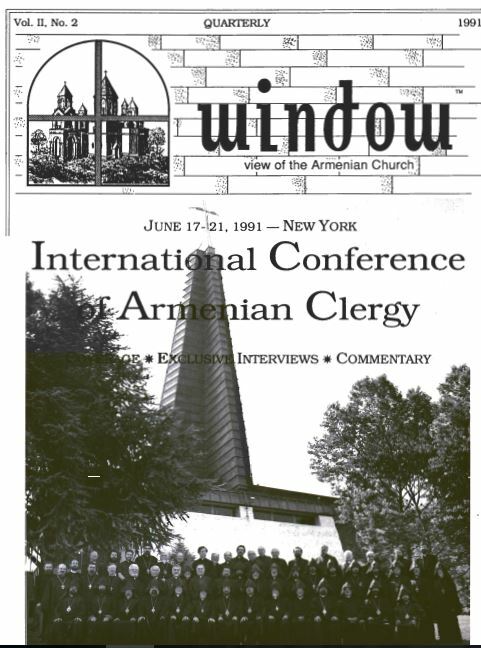 1989 by a group of clergy and lay servants of the Armenian Church. and Religious characteristics of the Armenian Community. opening for a Director of Operations at the ACRAG headquarters. mandatory. Send resume to ACRAG. A HyperCard* stack explaining ACRAG aims, services and products. Moderating a Parish Discussion Group? If so, then Window can help you spark dialogue and debate. of fresh air_. Open a new Window today! Make check payable to SRP.